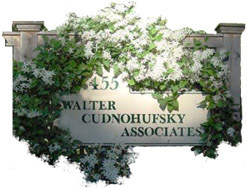 Walter Cudnohufsky Associates, Inc. was founded as a sole proprietor business in 1990. This occurred after Walter and his partners closed Conway Design Associates, Walter's previous partnership. The firm began as a part time business. In 1992, WCA expanded when John Saveson, registered landscape architect and architect joined the firm. The firm grew steadily through the 1990’s. In 2003 WCA became incorporated as Walter Cudnohufsky Associates, Inc.
Today WCA has a core crew of employees and consultants with mixed interests and skills.